Among the nocturnal creatures that Willow the Vampire and her friends might come across as either friend or foe will be undoubtedly moths and their supernatural counterpart, the fairies. It is easy to see how in ancient times people mistook butterflies and moths for magical creatures. The way moths are attracted to light, even if it burns them and the way butterflies magically appear out of their chrysalis to eventually feed on nectar of flowers seems somehow supernatural and otherworldy. The beauty of moths and butterflies, their stunning array of colours and patterns, have made them the most sought after, studied and most admired of all insects. Both belong to the order of Lepidoptera, meaning “scale wing” in the Greek language. They have four broad wings which are coated in miniscule, overlapping scales, which are in fact hollow, flattened hairs creating the iridescence and bright colours. Nearly all moths and butterflies are plant feeders. There are a total of 131 families and some 165,000 species in the world, many of which are threatened with extinction due to loss of habitat and use of insecticide in agriculture. Willow would naturally be more concerned with moths than butterflies, particularly since moths and bats are natural enemies. Surprisingly, almost 85% of species in the Lepidoptera families are actually moths, most of which are nocturnal. Owlet or noctuid moths have hearing organs on their thorax which can pick the echolocation signals bats use to get about and find their prey (namely moths). While fairies can have any number of coloured outfits, just like butterflies, moths are generally more restraint in their colouring. Many have cryptic colouration, meaning they have mottled wings that can blend into the woodland habitat more easily. Among the largest moths – or indeed butterflies – is the Giant Agrippa with a wingspan of 12 inches (30 cm). 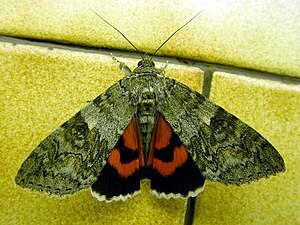 It also has mottled colouring, while the Red underwing moth sports bright red colours for its pair of smaller underwings. The beautiful Indian Luna moth on the other hand only lives for one week, during which it doesn’t feed at all; therefore, it is less careful in its colouring. It has two long tails emanating from its underwings and is a pale turquoise colour. The Bent-wing ghost moth is brightly coloured in russet and browns, while the Owl moth can blend into any woodland habitat without being spotted, its mottled wings provide perfect camouflage. Perhaps the star prize for colouring has to go to the Giant atlas moth, which sports red, blue, grey, yellow and orange in its wings – as well has boasting of the largest wind surface area of any moth in the world. The Eyed hawk moth is less colourful but still impressive. It has large eyespots on its hindwings to frighten off predators. Its forewings mimic dead leaves to render their owner invisible in woodland undergrowth. I’m as yet undecided if Willow meets fairies who are friend or foe. 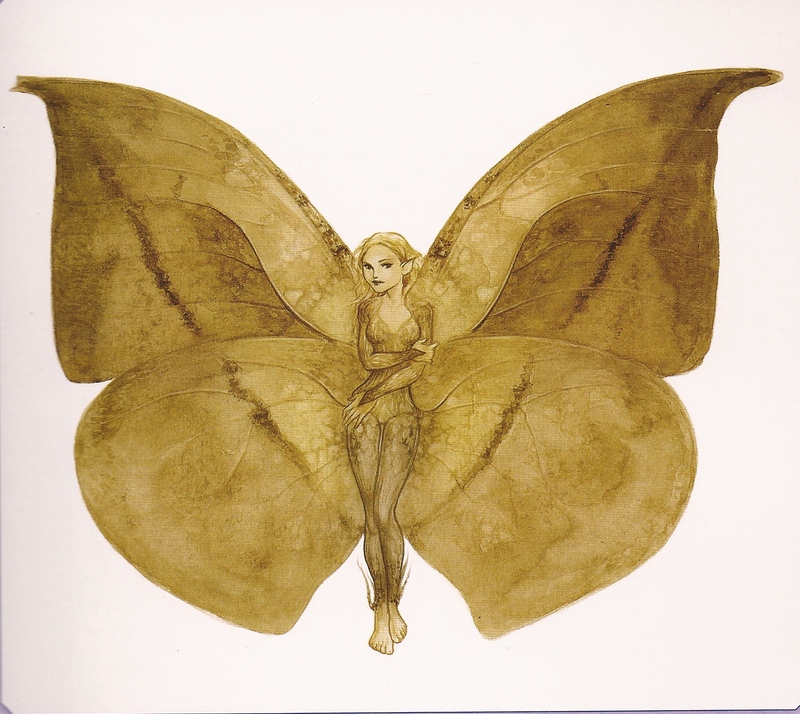 Spirits like fairies are often portrayed as quite mischievous, only interested in pursuing their own ends. 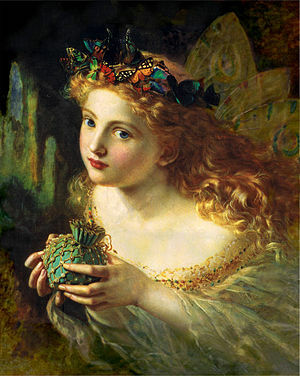 Fairies are often accused of stealing babies and leaving changelings in their place and there are numerous methods by which people sought to protect themselves from becoming a victim of fairy magic, such as using charms made from rowan or using herbal concoctions or carrying cold iron, which fairies for some reason are allergic to. Just like people prefer butterflies over moths, they seem happy liking fairy godmothers but rather prejudiced against other kinds of fairies. Given that we have so far seen how many creatures of the night have simply been maligned because they are nocturnal it seems inevitable that moths and fairies should become Willow the Vampire’s allies rather than her enemies. Ya, it’s your local fairy sprite here! 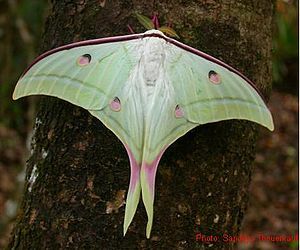 Like Magsx2, I like the Indian Moon moth and have never seen it before. I quite adore fairies, whether naughty or not, (I think I am really a Victorian who has time travelled). therefore I shall await Willow’s escapades with the fairies with excitement. One note on moths, however, I did like them until recently – one has been in my wardrobe and bitten holes in a few of my favourite jumpers. Must have been the Hungry Jumper Moth, notorious for that sort of thing. Most widespread in Greater London, where they’re attracted by the blonde halo of Boris and the glare of the London Eye:) Mating season conincides with mayoral election time. Are you saying that Boris is a giant moth who is driving other moths into a sort of frantic craze in the hope of mating with him? I would like to know what Big Dave Cameron thinks of his top star acting in such a manner! blonde halo = light burns moths that were stupid enough to follow to that point. I have never heard of the moom moth before, what an unreal looking moth it is, I think it is shaped a bit like a flying craft that I am seen in some movies, I also love the colour as well, very unusual. Hi magsx2, actually, it’s called the Indian Moon Moth, Wiki mistyped the caption:) but I agree, it’s a beautiful & unusual moth. In literature, folklore and legends fairies are often shown as being rather wicked creatures, so I’m seeking to redress that a bit in the next Willow book.